And so 2 become 3. We arrived into Darwin at 3am and the woman at the Tourist Information Desk told us that it wasn't worth going into the city and checking into a hostel tonight and to just join all the other sleepers. So we got out our sleeping bags and spent the night on the floor of Darwin Airport's arrival lounge- that's $30 saved! Coming from England, Australia is expensive. Coming from South-East Asia, Australia is bloody ridiculous! We got a taxi to the centre in the morning and checked into a hostel, we met up with Charlotte, Grace's sister and shared a room with her. After a quick tour of Darwin, Grace and I set out to find Charlie, and luckily found her at the 2nd hostel we tried at. She hadn't realised that we were coming to Darwin so it was a bit of a surprise when she got a call saying that we were in the hostel's reception looking for her! The rest of the day was spent sitting in a park and drinking some overpriced beer. We went out that night, but I bailed early, not really wanting to spend $8 on a drink! On the second day we explored a bit more of Darwin. It's pretty small around the centre and just walked around for much of the day. When it got to the evening, me and Charlie went to an outdoor 'Deckchair Cinema' and watched a film on a bit screen, sitting in deckchairs. It was pretty cool, and at one point a possum came up to us and tried to steal our food. I'm sure this is a regular occurance for Australians but I found it pretty exciting. We made our way to the beach for the next two days and just chilled out, making the most of the summery weather as we're going to be heading to winter for the next 2 months! The weather was a bit weird as it was boiling hot during the day but as soon as the sun went down it was freezing and I got my jeans and hoody out once again. On one of these days we got a Dominos for dinner. I know I'm budgeting but $7 for a large pizza was irrestible. However, the Australian version of large is a medium to us and they don't include dip! The dip that I bought wasn't half as good as the usual Dominos dip either. On the last day, me and Charlie did a tour to Litchfield National Park. It was a full day thing and we began by handling a constrictor. I got a little scared and our tour guide wrapped the thing completely around my head! We then got onto a boat to see some 'jumping crocs'. The first thign we were told was not to move over to the other side of the boat 'cause it might tip over. This wasn't very comforting when the next bit of information was that the crocodiles would eat us within 90 seconds of hitting the water. Fortunately, nothing bad happened and we saw some huge crocodiles jumping out of the water to grab some meat being offered to them on a piece of string. At the National Park we first of all saw some termite mounds (see picture above or where ever it appears when I click post) these were pretty impressive. 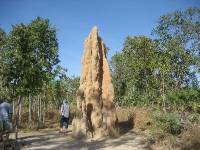 These termites dedicate their whole lives to building these mounds, one of them that we saw was 50 years olds! We had an awesome buffet lunch, and as a true, hungry backpacker, I finished off all the leftovers. We headed to a waterfall where most people got in and swam. Although there were loads of fish swimming about too, so I couldn't go in. Our tour guide got in and started feeding these fish and then hitting them so that they flew out of the water and were hitting people in the face. It was disgusting. But I can see it being fairly amusing to someone who didn't think that there is little worse in the world than being hit with a fish. The next place we visited was Buley Rockholes, a collection of water holes, which were fishless. Me and Charlie found a big rock to jump off and spent a good 45 minutes jumping off of it. I had a bit of a moment where I feared for my life. While I was underwater, the tour guide had put a crocodile's head into the water, and everyone started pointing at it, I freaked out and honestly thought that I might die. Only catching on when they all started laughing! We went to a night market on the beach, wandering around the stalls, mostly full of things that you can get for a fifth of the price in Asia! I don't think I can eat Asian food again, or at least not unless I'm getting it for Asian prices! We packed up and went to the airport a bit early and slept there again (another $30 saved) before getting our 6am flight to Cairns and meeting Elena. Toni Loving the savings...you go girl!! G.dad How did you know that one termite was 50 years old?